Can be built on a colony or an asteroid. Cannot be built on the Terrene planet. 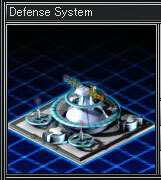 Initial: Boosts shields and weaponry to all fleets left on defense. Combines systems on all planets. Level Up: Increases the bonus given to defending fleets.